Interesting data from the German Kraftfahrt-Bundesamt (Federal Motor Transport Authority). The following table shows the total number of registered TR1 in Germany. But only official imports are counted. They can not differentiate a "grey" imported TR1 from other grey imported Yamaha models. TR1's with historical license plate ("Oldtimer- bzw. H-Kennzeichen") are also included. 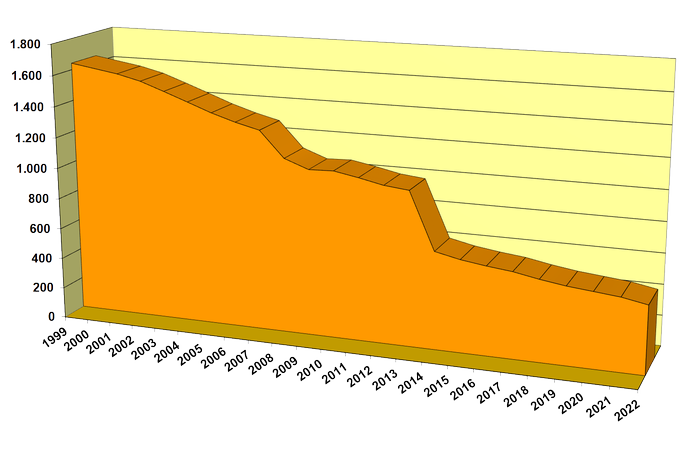 2008: Starting 2008, the numbers do not include temporarily closed down/decommissioned bikes ("vorübergehende Stilllegungen/Außerbetriebsetzungen") anymore, and therefore might be to low! The numbers migth even get slightly higher from one year to another as from 2009 to 2010. 2014: In the course of quality-promoting measures, the inventory data of the Central Vehicle Register are compared to the type-approval data since 2014. In case of deviations an implausible type key number is then set to "000" and therefore not counted anymore. This caused the major decline in numbers. For the original explanation from the KBA in German click here . I always ask for HSN ("Herstellerschlüsselnummer" / "Manufacturer key number") 7101 which is "YAMAHA" and TSN ("Typschlüsselnummer" / "Type key number") 168 which is "5A8 (XV 1000)". Everybody can ask here for such numbers. Best is to attach a scanned copy of the motor vehicle registration certificate ("KFZ-Schein").